I do have to say, I really love my work space. I have an office, but I don’t spend much time in it. I prefer to be out in the library where I can interact with students and teachers who are using the library. When I need to do work that requires my complete attention or a quiet space, then I’ll use my office. I have recorded quite a few screencasts in there already this year! 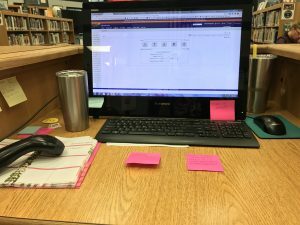 Here’s my circulation desk workspace. I’ve got everything I need right here! And I have a great view of the library too. As you can see, my main method of organization is sticky notes. I love the feeling of finishing a task and throwing my sticky note away. And having that visual reminder staring at me to finish a job is just what I need to keep me focused. And a pano view of the whole space! 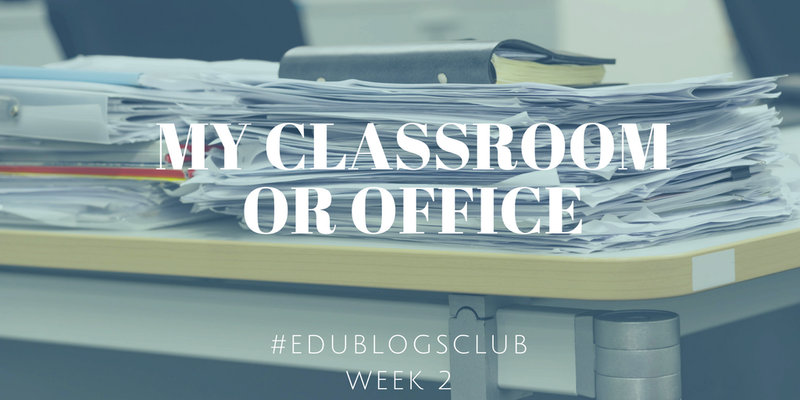 It’s a wonderful space and I have plenty of ideas to make it even better for students! Exciting things are coming! We have a great library at AHS! Here’s the view of my other desk in my office. (And yes, I still have Christmas wrapping paper there in the corner! No judgement.) 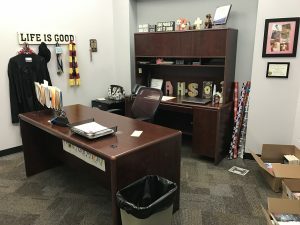 Other important things to note about my office…my graduation robe that doubles as Harry Potter dress robes (Yes, I’ve worn these this year), my Griffyndor scarf, and my beloved Life is Good plaque. Also note the boxes of ARCs in the corner. I love to use those as giveaways and incentives for students. And they love it too! I have a great workspace, but the best part of my space is of course the students who use it. When I have a buzzing library with students choosing books, using the Makerspace resources, enjoying their time, that’s when I am most excited. Love the panoramic shot. My favorites of the library include my “goodnight” black and white shots when the busy day is done and it gets to rest. I love that! The idea of putting the stacks to rest after a busy buzzing day. Thanks for sharing. I really like how you discuss using different spaces for various purposes. This is so important. Thank you! One of my goals is to make the library a more flexible space. It should adapt to the needs of the students and teachers here. Always good to have a goal in mind and project ongoing! I enjoy studying in my university library, I’d love to work in a library as a job. It’s truly the very best job in the world! I’m proud to call myself a school librarian.